GWINNETT COUNTY, Ga. -- Waffle House restaurants have been the target of two separate armed robberies in Gwinnett County. The crimes happened a month apart, both around 5 a.m. The first took place on July 13 at the Waffle House located at 2320 Satellite Boulevard in unincorporated Duluth. 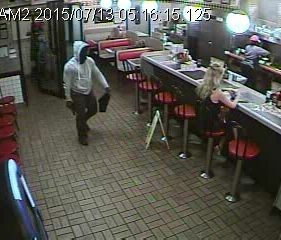 The second occurred at the Waffle House located at 1205 Lakes Parkway in unincorporated Lawrenceville on August 17. In both robberies, witnesses told police that a man walked into the restaurant with a gun demanding money. He then walked behind the counter and stole the entire cash register. The suspect is described as a man between 20-and-30 years old. He was last seen wearing a grey hoodie, dark-colored pants and a dark colored mask. Police believe he's driving a black four-door car -- possibly a Hyundai Elantra.